Water figures prominently in the Bible. God is sovereign. He created water and our need for it, and it becomes a fitting metaphor for spiritual principles as part of Jesus’ promise to offer us Living Water. Like the other “My Psalm” devotionals, this is a book of original prayer psalms, not at all designed to be scriptural, but based upon personal worship and praise times. 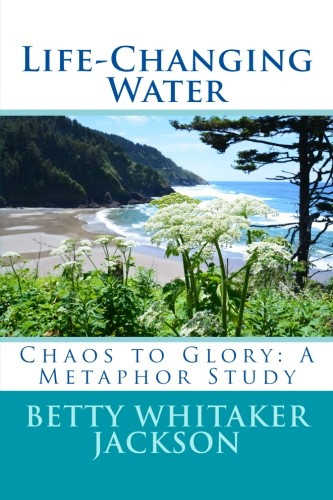 Life-Changing Water: Chaos to Glory: A Metaphor Study, includes over one hundred fifty original poems, “My Psalms” of adoration, confession, thanksgiving, supplication, and reaction to life events. Devotional entries include an original psalm, Scripture sites, “Think about These Things” reflections, some traditional hymn texts and references to contemporary music, discussion topics and references, and a place to journal. Water photographs and art and music references abound. Just as water sometimes drips slowly, or meanders, or flows in rivulets, so this book is designed for the reader to stay for a while to drink deeply or to use as short devotions individually or in a group setting. It is not merely a daily devotional, but a reference during times of crisis, or a stepping stone to deeper study. Water is a life-giving, life-changing force. May this book be a treasure to your soul, be a companion in days of want or days of abundance and be a blessing to you and others who daily journey on our faith walks together. May you be at once invigorated, challenged, chastened, christened, and inspired as you read what the author has written, understood, and shared. Great group text for study too.